My husband and I love to entertain, but it's been a while since we had anyone over. So, when a friend of mine came to visit with her parents (they hosted us after the Warrior Dash, gave us hot showers, and steak! ), we went a bit hedonistic with food. Still it was great fun, and good time was had by all. - 3 kinds of pirozhki: potatoes, mushrooms, and scallions; red cabbage, red onion, smoked sausage; dates wrapped in mozzarella cheese and prosciutto. 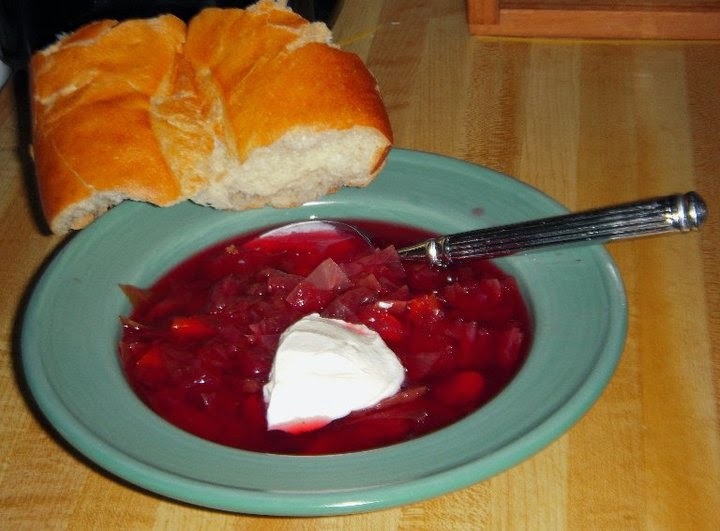 (You can find a recipe for the pirozhki dough here). - Borshch (the hot, red version). - Herring in a fur coat. - Veggie platter: locally grown organic pink tomatoes, home-made sweet and tangy pickled cucumber spears; home-made savory pickled yellow squash with extra dill. - Iced tea: a mix of white herbal tea and black Russian tea. All of these, except the veggie platter were made a day in advance, so all we had to do was heat up the borshch. This was fun - after dark on the porch, in candle light, with chimnea going for warmth and lovely, fragrant smoke. - Whole-wheat pasta with browned beef and home-made, coconut-milk-based tomato pasta sauce. - Caprese - tomato slices, mozzarella, fresh basil leaves on toothpicks, drizzled with olive oil and balsamic vinegar. - Sauteed pickled squash, carrots, sugar peas, broccoli and portobello mushrooms on a bed of fresh spinach leaves. - A choice of chablis or merlot.